CD105 or Endoglin is a type I homodimeric transmembrane glycoprotein. It is an accessory protein of the transforming growth factor beta receptor complex and binds TGF beta 1 and 3 with high affinity. Expression of CD105 is elevated on endothelial cells, particularly on proliferating cells. Accordingly, it plays a role in healing wounds and is expressed in developing embryos, inflammatory tissues, and solid tumors. CD105 is also expressed in mesenchymal cells. Mutations in the endoglin gene cause hereditary hemorrhagic telangiectasia, also known as Osler-Rendu-Weber syndrome, a multisystemic vascular dysplasia. 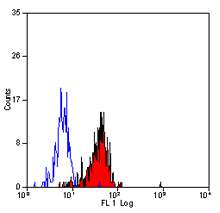 CD105 has different isoforms that arise from alternative splicing. Tormin A et al (2009) Characterization of bone marrow-derived mesenchymal stromal cells (MSC) based on gene expression profiling of functionally defined MSC subsets. Roh JD et al (2010) Tissue-engineered vascular grafts transform into mature blood vessels via an inflammation-mediated process of vascular remodeling.